The most crowded alien planetary system found yet possesses five worlds all orbiting a star at least 12 times closer than Earth does the sun, researchers say. Investigators discovered these exoplanets using NASA's pioneering Kepler space observatory. The orbiting telescope has detected more than 2,300 potential alien worlds since its March 2009 launch. It searches for these planets by observing more than 160,000 stars simultaneously, looking for small dips in stars' brightness due to orbiting worlds passing in front of them. The researchers used Kepler to analyze the planetary system around the star KOI-500, a star about the mass of the sun but only about three-quarters its diameter and only about 1 billion years old, less than one-quarter the sun's age. KOI-500 is approximately 1,100 light-years away in the constellation Lyra, the harp. "All five planets zip around their star within a region 150 times smaller in area than the Earth's orbit, despite containing more material than several Earths," study lead author Darin Ragozzine, a planetary scientist at the University of Florida at Gainesville, said in a statement. "At this rate, you could easily pack in 10 more planets, and they would still all fit comfortably inside the Earth's orbit." These planets orbit so near KOI-500 that their "years," or the time it takes to circle their star, are only 1.0, 3.1, 4.6, 7.1, and 9.5 days long. The planets are so close together that their mutual gravity slightly pushes and pulls on their orbits. Still, their orbits appear completely stable overall — they appear in no danger of crashing together, or of hurling each other away from or into their star, Ragozzine told SPACE.com. Intriguingly, the outer four planets orbiting KOI-500 follow a synchronized orbit seen in no other system to date, a so-called four-body resonance. "These four planets come back to a similar orbital configuration about every 191 days," Ragozzine said. "We think that the migration process that put them into their current orbits also helped synchronize them into a four-body resonance," Ragozzine said. Recent theories for the formation of the giant planets of our outer solar system, such as Jupiter and Saturn, also involve planets moving during the formation process. As these giants shifted their orbits, researchers suggest their gravitational pulls hurled asteroids and comets toward the inner solar system, causing the so-called Late Heavy Bombardment about 4.1 billion to 3.8 billion years ago, which pummeled Earth, the moon and the inner planets with a barrage of countless impacts. As scientists have discovered more and more exoplanets, they have found that most observed worlds orbit much closer to their stars than any planet in our solar system orbits the sun, including so-called hot Jupiters, which are giant planets orbiting closer to their stars than Mercury does the sun. Scientists still don't understand why most observed alien planetary systems look so unlike ours. "This difference probably has to do with the different ways planets interacted with the disk of gas and dust they came from," Ragozzine said. "There's still a lot of work that needs to [be done to] understand these processes better." 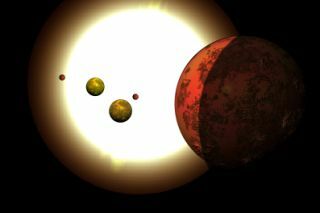 "As the most compact system of a new compact population of planets, KOI-500 will become a touchstone for future theories that will attempt to describe how compact planetary systems form," Ragozzine said. "Learning about these systems will inspire a new generation of theories to explain why our solar system turned out so differently." The scientists will detail their findings today (Oct. 15) at the annual meeting of the American Astronomical Society's Division for Planetary Sciences in Reno, Nevada.